Guess who's staging a comeback? MySpace released a video Monday offering users a taste of what they can expect from its imminent relaunch and, we have to say, it looks pretty darn slick. The social network was bought by Specific Media for a bargain basement $35 million (£21.5) over two years ago and the company has been plotting its triumphant return ever since. At first glance, it looks like the new ownership, which includes music and movie megastar Justin Timberlake, is hell-bent on luring the world back to the once-dominant social network. The two-minute video demonstrates a clear and attractive new horizontal design. 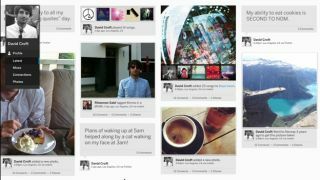 It's not terribly disimilar to the way Pinterest is laid out and there's a hint of the Windows 8 UI in there, too. Naturally, the new MySpace remains music-centric. Audio content can be controlled from an omni-present navigation panel, while photo albums can also be paired with playlists (called Mixes) to mark any occasion. A Discover tab within the navigation panel will bring access to trending artists, music, mixes, radio, videos, news, and forthcoming concerts. These items can then be dragged and dropped into your own folders. Artist pages have also been completely and beautifully overhauled. It looks like these pages will be well stocked with tracks, albums, and videos. Whether that content will be licensed through a partner service, or provided by MySpace itself remains to be seen. Users can also sign in with Twitter and Facebook and find friends who are also using the new MySpace. It'll allow for status updates to be cross-posted on the rival social services, as well. At the end of the video, there's a call to action encouraging viewers to sign up for an invite, which means we're probably not too far away from a hands-on look at the revamped site. While a return to its pre-News Corp glory days might still be an outside bet, there's enough evidence within the two-minute video to suggest MySpace might find a home within our daily lives once again. Only this time most of us will have more sensible haircuts and less teen angst.